The Dickens the Dickens fans generally rate as his best. For non-Dickensians like me, the one Dickens you really ought to read. The case of a contested will, Jarndyce v Jarndyce, has ground its way through the Court of Chancery for longer than anybody can remember. It's become a source of cruel humour for the armies of lawyers who make a living out if it, and it crushes all those who fall into its path. It ensnares rich and poor alike. Into its shadow fall the doting Ada Clare and the vapid Richard Carstone, taken into the care of John Jarndyce as wards in the case, along with the orphan Esther Summerson. Meanwhile in Lincolnshire it touches on the life of Lady Dedlock, who has a guilty secret. And then there is Jo the crossing-sweeper, who saw something he wouldn't forget, and Harold Skimpole who really ought not to be let out without a lead, and Mrs Jellyby, whose devotion to charitable works leave her no time to keep her life and family in order. And, this being Dickens, a whole load of others. It is massive, and complex, and so very, very Dickensian. But it is compelling reading. One of those books you don't ever forget. I can't not give it ten out of ten. This is now setting off on a ring which will take it far and wide! Dispatched to caligula03 from the Civic Centre Post Office in Reading just after 4pm this wet and windy afternoon. I'm enjoying the book thoroughly. It has the same sort of humor as the Rumpole books though with far more complexity in true Dickensian fashion. I should have the book done by next week some time. What is the Bleak House? It is an old mansion, home of John Jarndyce and his three wards: Ester, Ada and Ricard. It is also the squalid conditions of Tom's-All-Alone. It is the bleak out come of Jarndyce vs. Jarndyce. It is the Victorian shame of an illegimate child. There are many bleak houses in this book. Bleak House carries a warning against the excesses of nuisance suits and the danger of a laisez-faire government which it wraps up in a delightful albeit complex and dense comedic romance of a young woman supposedly orphaned and sent to live with her guardian who is stuck in a generations long lawsuit over an estate. 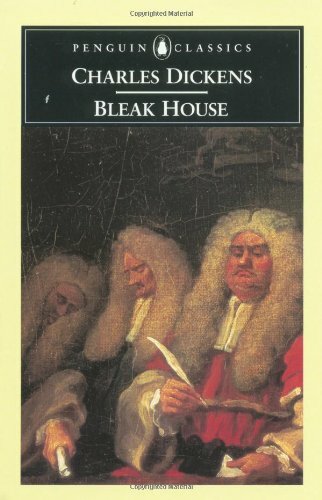 Interestingly, I recently read an American story that obviously borrowed heavily from Bleak House. To anyone who enjoys Bleak House, I recommend The Big Mogul by Joseph C. Lincoln. Hurrah! Charles Dickens has safely arrived in Zurich after his long perilous journey from California :-) Thanks to Caligula03 for sending & Swanofkennet for staring the ring. I have to confess that I am a 'Charles Dickens' virgin, so will report back once I've read. I've a few books ahead of this one, but will probably start this in a week or so. Wow, what a book! I have to admit that I nearly gave up several times, just because the story is so long & complicated, but I'm glad I didn't! Dickens introduces a huge numbers of characters and storylines, and you really need to keep concentrating throughout the 989 pages! I think I'm right in thinking that this story was serialised and sold as such before becoming a novel, so perhaps this accounts for the many cliffhangers / stories / characters / and various endings and beginnings! I would recommend reading the introduction after you've finished, as it gives a good commentary on the interpretation of the novel, although I like Caligula03's summary above :-) I can't really add to the previous journals in terms of analysis, but I will add that Esther's story ends as I hoped it would! "I was so busy that I could not believe it was breakfast-time when I heard the bell ring. Away I ran, however, and made tea, as I had already been installed into the responsibility of the tea-pot; (...)"
I love the phrase, "responsibility of the tea-pot"! Okay, final journal from me: I've tried several times to get into the story and managed to get a bit farther every time but really am not enjoying the overall read and story and still feel daunted by the size of the book, seeing that I find it slow-going reading. So, finally, I'm surrendering and sending it back to Swan-of-Kennet. Returned home today (the postie had been hanging on to it for a couple of days, apparently) after its marathon trip around the world. I want to read it again but after that I may well start a new ring. This one is on its way to another bookcrosser as part of a slightly tardy NSS Valentine. This looks quite hefty, but its one of the BBC Big Read books, so I'll be giving it a go...... eventually!! I inherited an almost complete set of Dickens, so am liberating those duplicate copies from my TBR pile. To be released or passed onwards soon. Released by some friends at Calke Abbey somewhere. You've found a BookCrossing book! Congratulations! I hope you enjoy it. Please feel free to make a journal entry letting the previous readers know what you thought of it. Then keep it or release it back into the wild. If you decide to join BookCrossing (not compulsory), please consider putting me (bigcurlyloz) as your referring member.